A 4-storey tower mill, built in 1803, restored to working order in 1998. All original machinery in place, including three pairs of millstones. Current work being undertaken to refurbish sails and cap. A broken curb is stopping further progress, requiring that the cap be removed. Some Sundays will be work-ins so if you fancy helping please give us a call. Other times by appointment only. School parties, Scouts, Guides Cubs, Beavers and Brownies welcome. Turn off A1123 at Haddenham. 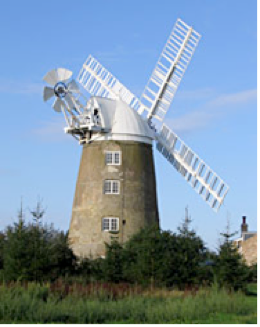 Mill is 3/4 mile South of Haddenham village towards Aldreth.